ASHLEY RELYEA RECEIVED the Most Valuable Female Field Athlete, Coachs Award (female athlete) and the 2004 Billy Moran Scholarship Award at Thursday nights ceremony. LAKE HUNTINGTON  The 2004 Sullivan West Spring Sports Awards Presentation was held last Thursday in the auditorium of the new Sullivan West High School in Lake Huntington. Following an introduction by Athletic Director David Franskevicz, the SW coaches stepped up to the plate to introduce the members of their teams and hand out trophies and special awards.  Most Valuable Track Athlete (Male): Mike VanWagenen.  Most Valuable Track Athlete (Female): Jamie Clifford.  Most Valuable Field Athlete (Male): David Abram.  Most Valuable Field Athlete (Female): Ashley Relyea.  Most Valuable Baseball Player: Bill Nordenhold.  Most Improved Baseball Player: Steve Daley.  Most Valuable Softball Player: Erin Rosenberger.  Miss Softball 2004: Lesley Bright.  Most Valuable Golfer (Male): Sean Semenetz.  OCIAA & Section IX Golf Participant (Male): Joe Winski.  Most Valuable Golfer (Female): Nellie Norden.  Most Consistent Golfer (Female): Melanie Kleiner.  Most Valuable Senior Male Athlete: Bill Nordenhold.  Most Valuable Senior Female Athlete: Jessica Lederman.  Milt Gaebel Award (Male): Mike Erlwein.  Milt Gaebel Award (Female): Erin Rosenberger.  Coaches Award (Male): Greg Brewer.  Coaches Award (Female): Ashley Relyea. 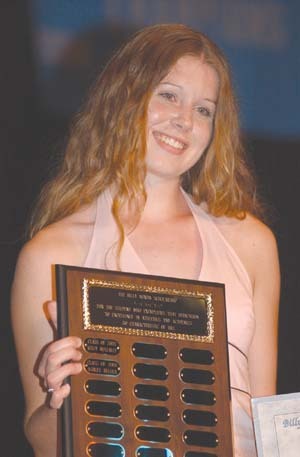  Billy Moran 2004 Scholarship Award: Ashley Relyea. Billy Moran of Hortonville, a graduate of Delaware Valley Central School, went on to become a starting player on the football and baseball teams at Union College. In April 1981, he was killed by a drunk teenage driver while in Florida during spring baseball training. In an effort to keep the flame of his memory burning brightly, his family and friends established the Billy Moran Scholarship. On Thursday, his parents Bill and Kathleen Moran, presented the new high school with a large framed photograph of their son. A similar photograph has been on display in the DV school since the scholarship was founded.  Select Male Athletes: David Abram (football, winter track, track, 1998-04); Greg Brewer (soccer, basketball, alpine skiing, baseball, golf, 1998-04); Mike Erlwein (cross country, football, soccer, basketball, baseball, golf, 1998-04); Karl McCormack (soccer, basketball, alpine skiing, golf, 1998-04); Bill Nordenhold (soccer, basketball, baseball, 1998-04); Brian Parks (soccer, basketball, baseball, 1998-04) and Bryan Sandler (football, winter track, track, 1998-04).  Select Female Athletes: Madelyn Argueta (soccer, basketball, softball, 1999-04); Lesley Bright (soccer, basketball, softball, 1998-04); Vanessa Kline (soccer, basketball, softball, track, 1998-03); Jessica Lederman (soccer, basketball, softball, 1998-04); Amanda Patterson (soccer, basketball, softball, 1998-04); Rachel Peloquin (soccer, basketball, softball, cross country, 1998-04); Ashley Relyea (basketball, cross country, winter track, track, 1998-04); Erin Rosenberger (winter track, soccer, softball, 1998-04) and Katie Thelman (alpine skiing, basketball, soccer, 1998-04).